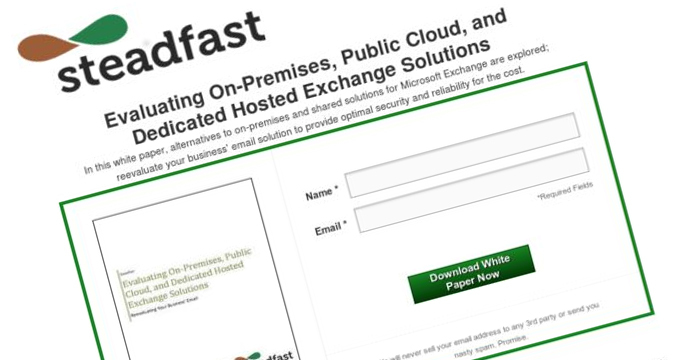 Web Hosting Services – CHICAGO, ILLINOIS – Steadfast.net has issued a very enlightening Whitepaper that details the appropriate methodology in evaluating Business Email Solutions. It is available now at no cost, and is a very worthwhile read. Steadfast Networks is a Chicago based IT infrastructure provider that specializes in highly flexible cloud environments, dedicated servers, and managed Colocation services out of fully redundant data centers in Chicago and New York. Their services are most suited to small to medium sized businesses, the financial sector and Internet/Network service providers. According to a company spokesperson, Steadfast Networks are experts in providing Cloud Hosting Services, Dedicated Servers, Chicago Colocation, New York Colocation, Managed Colocation, Disaster Recovery, Managed Security and Network Storage services. Steadfast’s Cloud Hosting is a versatile, robust hybrid cloud hosting platform, designed to offer clients all the flexibility of their own public cloud web hosting alongside the impressive security of a private cloud platform hosting solution. Customer’s rate very highly the special attention they receive via live chat and phone options. They report that their sales agents are very quick, knowledgeable and friendly while answering any queries. Email and Trouble Ticket responses are quick and to the point. The Steadfast technical support team helps with mySQL and PHP upgrades, and without any downtime. Support is provided quickly without numerous back-and-forth communications. Established in 1998, Chicago based hosting company Steadfast.net, delivers high quality, powerful servers through robust dedicated server hosting, colocated server hosting, virtualized servers including a new cloud platform, and an impressive choice of managed colocation services. Steadfast’s award-winning services and dedicated support staff help customers from all over the world 24/7/365. Customers can choose basic hosting or a customized, fully managed dedicated server hosting solution, managed colocation solutions, or a cloud hosting solution that can be scaled up and down over time. Steadfast.net offers 100% carbon neutral hosting services as an environment-friendly provider. To learn more about Steadfast.net, visit Steadfast.